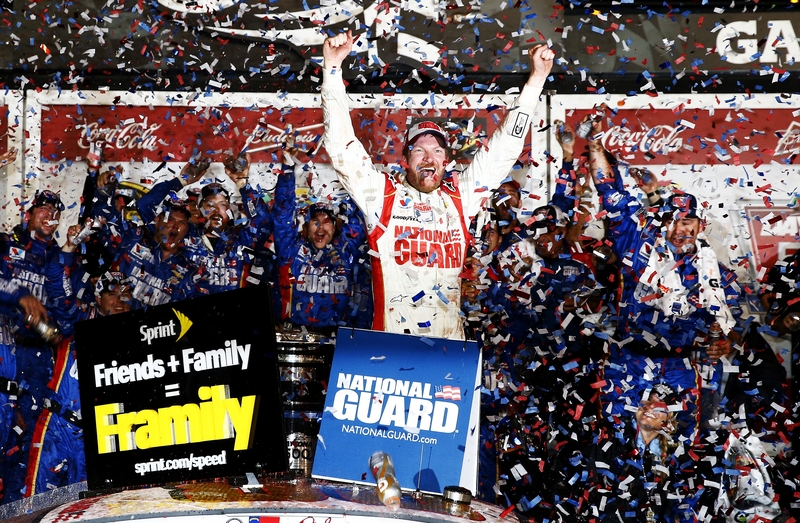 Dale Earnhardt Jr., driver of the #88 National Guard Chevrolet, celebrates in Victory Lane after winning the NASCAR Sprint Cup Series Daytona 500 on Sunday night, his second career win in the Great American Race. DAYTONA BEACH, Fla. — Dale Earnhardt Jr. is Dale Earnhardt Jr. again. A multi-car wreck erupted as Earnhardt charged to the checkered flag while holding off Denny Hamlin and the caution flag secured his victory in Sunday night’s rain-delayed Daytona 500 at Daytona International Speedway. The victory is Earnhardt’s second in the Great American Race and his first win on a superspeedway – the tracks on which he once dominated – since the 2004 season. As an added bonus, thanks to changes made to NASCAR’s championship system in the offseason, Earnhardt is now all but guaranteed a spot in the 16-driver Chase for the Sprint Cup. Jeff Gordon finished third, Brad Keselowski was fourth and Jimmie Johnson was fifth. Under threatening skies, the race got off as scheduled with pole-sitter Austin Dillon leading the first lap, before Hamlin took over. Hamlin, however, got some debris stuck on his front grille and was forced to pull out of line to lower his engine temperature. That allowed Kurt Busch to move into the lead. Kyle Larson slapped the wall hard and brought out the race’s caution on Lap 23. During a round of pit stops, Matt Kenseth spun on pit road after contact with Trevor Bayne and Danica Patrick was forced to pit in an awkward position after trying to avoid contact from Marcos Ambrose. The race restarted on Lap 27 with Paul Menard in the lead, followed by Kurt Busch. The engine on Martin Truex Jr.’s car expired, bringing out a caution on Lap 32. Truex was forced to the garage and out of the race. During the caution, it began to rain and NASCAR displayed the red flag at 2:12 p.m. EST, after the completion of 38 laps. After several storms, including two tornado warnings, the race restarted at 8:53 p.m. – almost 6½ hours later. The race returned to green flag conditions on Lap 47, with Kyle Busch in the lead followed by Kasey Khane and Hamlin. During a round of green-flag pit stops, Kahne spun on the exit to pit road and fell a lap down. Kyle Busch also lost a lap when he was penalized for removing equipment from pit road. Once green flag stops were completed, Paul Menard led the way on Lap 90 followed by Hamlin and Kevin Harvick. After 100 of 200 laps, Menard continued to lead followed by Jimmie Johnson and Earnhardt. On Lap 103, Tony Stewart brought his No. 14 Chevrolet to pit road for the first of several trips for a problem with his fuel cell. Shortly after another round of green-flag stops, Harvick nipped Brian Scott, who then hit Aric Almirola which ignited a 13-car wreck on Lap 145. On the restart on Lap 154, Greg Biffle took over the lead, followed by Earnhardt, Carl Edwards, Johnson and Matt Kenseth. During the next four laps, Earnhardt and Biffle traded the lead three times, with Earnhardt got around Biffle on Lap 155 to take the lead for the second time in the race. Dillon made contact with Larson in Turn 4 on Lap 162 to bring out the fourth caution of the race. This incident collected a total of 10 cars. During the round of pit stops, Brian Vickers was held two laps on pit road – one for pulling up to pit and one for not beating the pace car off pit road. On the restart on Lap 169, Earnhardt maintained the lead followed by Biffle, Edwards, Johnson and Kenseth. With 20 laps to go, Edwards moved out to the lead with Kenseth, Earnhardt, Biffle and Jeff Gordon close behind. Bayne wrecked on Lap 184 to bring out the fifth caution of the race. On the restart on Lap 188, Earnhardt led the way followed by Johnson, Harvick, Reed Sorenson and Keselowski. Dillon made contact with Ryan Newman on Lap 195 to bring out the sixth caution of the race. On the restart on Lap 199, Earnhardt held the lead followed by Keselowski, Gordon, Kyle Busch and Edwards.